I have written this review in two parts. The first is what you might call the “official review” which I have given to the ECF web site for our cycle campaigning community. It should appear on ECF.com shortly. But reading it I discovered some interesting content relating to my past role at CTC, the UK cyclists’ charity which prompted me to add some additional reflections which I have added here in my personal blog. Anyone wanting a comprehensive review of how our roads entered what we might call the “modern era” should look no further than this highly enjoyable read from British cycling journalist Carlton Reid. He has taken an investigation of the role cycling played in road modernisation in the late 19th and early 20th century and extended it to cover the origins of road construction, the engineering of cars and how this period of change was influenced by politics, business and social class. This is also very much a book for campaigners. It is the most thorough examination I have read of how the battles for influence were fought by cyclists and motorists across the Victorian and Edwardian period, particularly in the UK and the USA. From a modern perspective we might assume that these were battles between driving and cycling lobbies but the book is fastidious in showing that for much of this period these were often the same people fighting to improve the roads for both modes of travel. But Carlton is happy to call himself a revisionist. He does have a clear mission in this story. 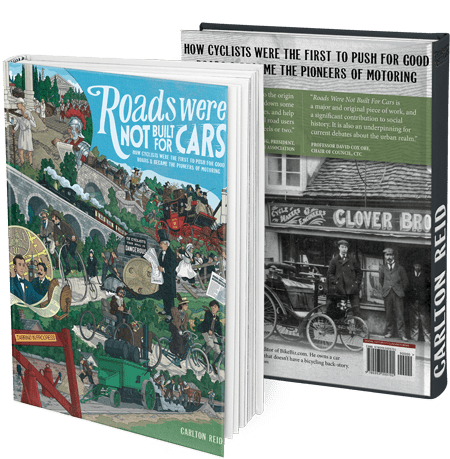 This book wants to reclaim a piece of history on behalf of cycling, correcting the way that the motoring lobby subsequently grabbed the road space and made it a “space for cars”, especially Henry Ford’s later claim that it was the motorists that created modern roads. This makes the book essential reading for modern campaigners who are challenging some of the attitudes and values from that period almost 100 years later. For many ECF members and supporters we can trace our roots back to those early campaigners in the Cyclists’ Touring Club (today’s CTC) and the League of American Wheelmen. The great pleasure of the book is that the reader can almost sense Carlton digging away in libraries and on line and uncovering gems that he just had to share. The role of cycling in the design and manufacture of early cars. The business tactics of the early cycling and motoring companies. He is particularly good at discussing the personalities of the period and their influences from pioneer roads campaigners like Rees Jeffreys to businessman Henry Lawson. There is a whole chapter on ten of the key names where one can sense the journalist in Carlton almost interviewing them to find out their cycling origins and how it influenced their careers. This book must be regarded as essential reading for anyone with an interest in cycling advocacy even if it is mainly focussed on the UK and the USA. Perhaps it leaves the door open for new chapters from contributors in other countries to add their story in later editions. To buy an electronic copy of “Roads Were Not Built for Cars” go to the book’s website. A few weeks ago I reflected on this people who came before me in my role as Chief Executive of CTC, the UK’s cyclists’ charity. On that occasion I was considering how I would have reacted if I was at the Club during the First World War when cyclists were being encouraged to join the Cyclists’ Regiments. A few days later I read Carlton’s book which triggered other thoughts about how CTC’s leaders reacted at various times in the history of cycling, and how we see them with the benefit of hindsight. The Club was a key player for most of the period of the book and its Council members and staff populated many of the campaigns and activities, something that still makes me enormously proud. This meant I paid special attention to the CTC figures in the book, especially two who filled the same post as me, Secretary, the position which became Director and then Chief Executive. When people want to critique anything CTC is doing their names are dragged out as examples of what the current generation might be doing wrong. What was really interesting to me was how Carlton’s neutral eye balanced some of the myths we have built up around these two inside and outside CTC. Ernest Shipton was Secretary from 1883 to 1907. 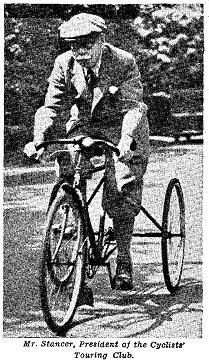 As “Roads Were Not Built for Cars” points out it was very common for our leaders of that period to be as passionate about cycling as motoring and Shipton was no exception. He was a founder of the Automobile Club, later to become the Royal Automobile Club. He is largely remembered by cyclists as the man who engineered a vote at the 1906 CTC AGM to allow the Club to admit motorists. This decision was overturned at the high court despite Shipton’s evidence that cars had made cycling no longer attractive and the Club needed to change. Within months of the court decision he had left his post and his 24 year career is only remembered in one line – the man who tried to turn CTC into a motoring organisation. In the other camp during that debate was George Herbert Stancer. He was already an influential figure as editor of Cycling, one of the biggest magazines of the time (and still around today as Cycling Weekly). Several years later he became Secretary of CTC, taking on a position he would hold for over 30 years, then continuing as President until 1964. To many in the Club (including me) GHS is the man who probably did more than anyone else to reform cycle campaigning as a defence against the encroachment and danger of cars. His predecessors fought for road improvement as equals, but by Stancer’s time as Secretary motorists dominated the politics of transport. The classic Stancer photo is an elderly GHS on his beloved tricycle, but the younger Stancer was altogether something more formidable. He is almost our Churchill, fighting back with his speeches, thunderous editorials and fierce letter writing. And like Churchill such strong opinions made him a divisive figure. I have been told numerous times by people outside CTC that the Club in the 1930s sold UK cycling down the proverbial river, in particular by its opposition to cycle paths. Within days of becoming CTC CEO in 1998 I was told by one of the most influential figures in UK cycling that if it wasn’t for Stancer and his colleagues the UK today would have a network of cycle lanes as good as any in the Netherlands. “CTC has a lot to answer for” I was told. “Roads Were Not Meant for Cars” does a lot to balance those myths and legends about Shipton and Stancer. Shipton may be damaged goods inside CTC but the book makes it clear that his views were mainstream at the time, nearly all the leading motoring figures had cycling roots and this golden period of “Road Improvement” they represented both modes on committees and campaigning bodies. CTC members voting 5:1 in favour of admitting motorists suggests he was in touch with the feelings of his constituency inside CTC too. In that context his actions look a lot more rational. Stancer too benefits from a detailed look at the situation faced by CTC in the 1930s. In particular the book has a detailed account of the now notorious Alness Report, published in 1939. This committee of Lords was stuffed with pro-motoring figures which made it impossible for the cycling witnesses to make any progress. However for many a belief that Stancer’s statements to the committee that cyclists didn’t want cycle lanes is a damning critique that undermines his place in history. The story looks very different in this book. Seeing the wider content of that report I realise now just how much the concern of the day for the cyclists was whether they should be removed from the roads entirely to allow speedier passage of cars. At the end of this section of the book is an exchange from the report which should probably be printed out and stuck to the wall over the desk of every construction engineer, cycling official and cycle advocate in the world. Are the two grounds upon which you are against cycle tracks these? First, because the cyclist insists on his abstract right to the use of the highway, and secondly, because it is less pleasant to use a cycle track than a highway? The second one you have mentioned is far more important. Cyclists would never insist upon their abstract rights if it were not that they are losing the chief pleasure of cycling by being forced on to the paths. If the paths are by any miracle to be made of such width and quality as to be equal to our present road system, it would not be necessary to pass any laws to compel cyclists to use them; the cyclists would use them. I have to say that even today it is very hard to disagree with GHS. Nearly 80 years later I am living in a country that has cycle lanes such “width and quality” in parts of Flanders that it is indeed unimaginable that we wouldn’t use them. Sadly we also have some parts of the country where the lanes are so bad they are almost unrideable for most of the year. The use of both is compulsory. But most of all I thank “Roads Were Not Meant for Cars” for bringing a thoroughly researched narrative and a clear context to those debates. Shipton and Stancer may have been made decisions that are not judged well by some in cycling today. But this well balanced narrative suggests that they were doing what they thought was right in the norms, the knowledge and the resources of the time. I am sure things we campaigned for and against in my time at CTC will look very different in the year 2114. I can only hope that we have a narrator like Carlton Reid to disentangle myth from legend when the time comes. This entry was posted in Book review, Musings, Publications and tagged Book review, Cars, CTC, cycling, Cyclists' Touring Club, GHS, History, motoring by kevinmayne. Bookmark the permalink. Reblogged this on Getting There. the cars today travel so fast that they are more dangerous. Sharing the road is becoming frightening, with texting so prevelent. nice book review! thanks for sharing.